MIGHT MAKE YOU SMILE TO RECEIVE NATIONAL LAUNCH IN ESSEX. EVENT TO BE HOSTED AT MANOR OF GROVES ON APRIL 13TH 2017 BY MATTHEW JAMES PUBLISHING, IN ASSOCIATION WITH HELEN ROLLASON CANCER CHARITY AND BRAFTERNOON. Might Make You Smile, a new book of short stories about cancer will receive a national launch on April 13th 2017, at the Manor of Groves Hotel in Sawbridgeworth, Essex. The launch event will coincide with the release of the book; a collection of short stories written by, Essex author, Brenda Burling. Far from your typical book about cancer, Might Make You Smile proves that even ‘The Big C’ comes with a sense of humour. All the stories featured in the book will make you laugh, cringe and everything in between; what’s more they’re all true! Each story in the book has been based on true accounts from people all over the UK, and the idea behind them is to make people laugh whilst empowering people and letting those suffering from cancer know that they aren’t alone in their fight. The launch of Might Make You Smile has been organised by Matthew James Publishing, in conjunction with the Helen Rollason Cancer Charity (who will receive 10% of proceeds from the sale of the book) and local support group Brafternoon; whose members provided inspiration for some of the stories featured in the book. 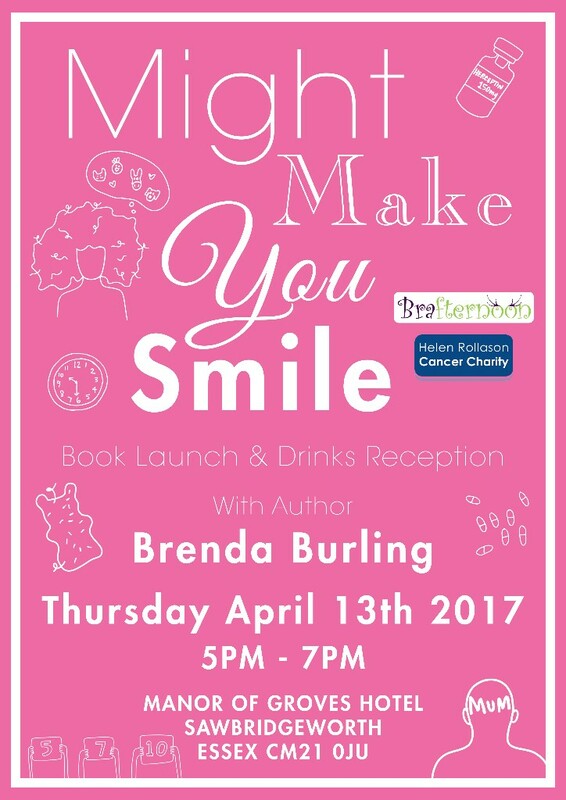 The Might Make You Smile launch will feature a reading from Brenda Burling and attendees will have the opportunity to buy a copy on the night and get it signed by the author. The event is free to enter and will take place in The Colonnade at the Manor of Groves hotel, from 5pm until 7pm, on April 13th 2017. The Helen Rollason Cancer Charity is dedicated to championing quality of life for everyone living with or affected by cancer. We are here to support men and women with all types of cancer at all stages; newly diagnosed, throughout and post-treatment, as well as their wider support network of family, friends and carers. We do this through the provision of support centres, complementary therapies, information and advice and awarding grants for clinical trials. 2012 saw the launch of Brafternoon; a unique kind of ladies-only support group for those with experience of all forms of cancer. Brafternoon offers a rare opportunity to spend time with ladies who really do understand; discussing a wide range of issues, swapping suggestions and experiences and ultimately sharing one another’s journey. Founded by Anita Gray, she is well best placed in her field of image consultancy and beauty and holistic therapies, to offer the ladies that lunch a helping hand in finding a way back to being confident, beautiful and to reaching an overall feeling of wellbeing. With other groups opening soon, it is felt that Brafternoon is so desperately needed throughout Hertfordshire and Essex. and an opportunity to leave everything else at the door for an afternoon. Brafternoon Ltd, is a not for profit company - whose sole aim is to provide a positive social experience, making a difference for ladies who have been affected by cancer. 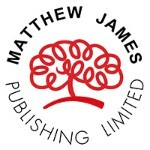 Matthew James Publishing is an independent publishing house based in Chelmsford, Essex and Marple, Greater Manchester. For over twenty years Matthew James has worked with authors, academics, schools and charities to publish everything from beautiful children's books and fascinating memoirs to acclaimed Religious Education programs and scholarly resources.